For several weeks Russian researchers on Vaygach Island have been under siege, blocked in their homes. Polar bears won't let them leave. Five polar bears are laying siege to a Russian weather station on Vaygach Island in the Arctic Sea. The animals set camp just several meters from the building, and two female meteorologists and a male technician working at the station have no weapons of protection from the polar predator. In the beginning of September, Minister of Natural Resources and Environment, Sergei Donskoy, became involved in the matter and called on his ministry to save both the humans and the endangered polar bears. Meanwhile, the governor of the Nenets Autonomous Okrug, Igor Koshkin, promised to distribute rubber bullets to the inhabitants in all coastal settlements. This is not the first conflict between humans and these animals. In the last 10 years the mass migration south of polar bears from the ice floes to the coasts has turned the Russian Far North into their kingdom. Local inhabitants and visitors will have to get accustomed to this and learn to live with the animals, experts say. Unfortunate refugees or lazy migrants? The first cases of polar bears approaching human settlements were recorded about 10 years ago on Chukotka, then on the coasts of Yakutia, and finally close to the Yamal peninsula. In 2012, at one weather station, a bear waylaid a scientist outside his home and attacked him. The unexpected visits began with climate warming. Scientists say that the polar bears' mass migration is due to their lack of desire to adapt to the new conditions, something the seals and other Arctic animals did. Scientists are convinced that it's not necessary to kill or wound bears to avoid attacks. "Nothing exceptionally frightening is happening at the weather station," said Nikita Ovsyannikov, deputy director of the Wrangel Island Reserve and a collaborator at the Institute of Ecology and Evolution Problems. "It's just that the people who are there don't know how to behave. They are afraid of being attacked. But no one attacks them! The bears have come to study the new and unfamiliar object." According to Ovsyannikov, the polar bear is an animal with a highly developed psyche and cognitive abilities. Living in severe conditions, it makes great effort to find food. It approaches scientific stations looking for food. As soon as the bear feels the impact of rubber bullets, he will back off a few kilometers from the station and forget about the meteorologists, Ovsyannikov explains. 1. Do not feed the bear, or at least don’t disperse garbage with food remnants. In 2014, one Russian mining company moved a well-fed female bear 40 kilometers away from its premises but the bear returned. 2. Behind the tough appearance of the polar bear hides a gentle and timid heart. Do not frighten it with your shouts and inappropriate behavior – this will only provoke its appetite. 3. Be calm if you see a polar bear. Do not threaten it with any gestures. Noise, flashes, the rumbling of firearms do not work in the conditions of the North. 4. The rubber bullet is the best solution if the polar bear attacks you. The painful shock will scare it away. Try not to kill it. Don't forget, the polar bear is a protected endangered species. 5. If the bear does not leave you alone, then before shooting to kill, try to negotiate and talk calmly with him. 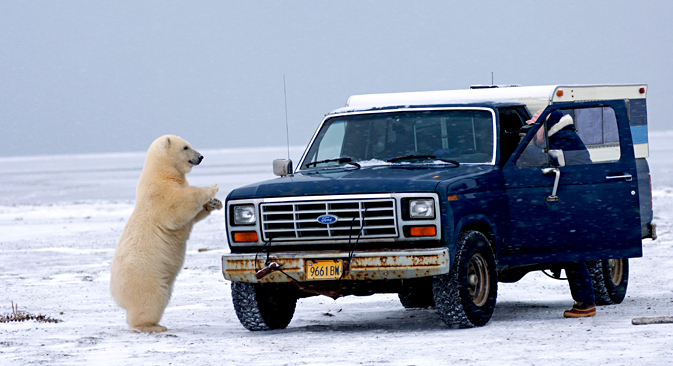 Sounds coming from a strange two-legged animal can confuse the polar bear.